It’s easy to forget about music that you already own. Sometimes that best track to add to your playlists might be something that’s been just out of your thoughts, or never got added to a playlist, or just hasn’t been played anytime recently. In today’s article, we look at a few great ways to discover (or rediscover) great tracks that already live in your DJ collection. 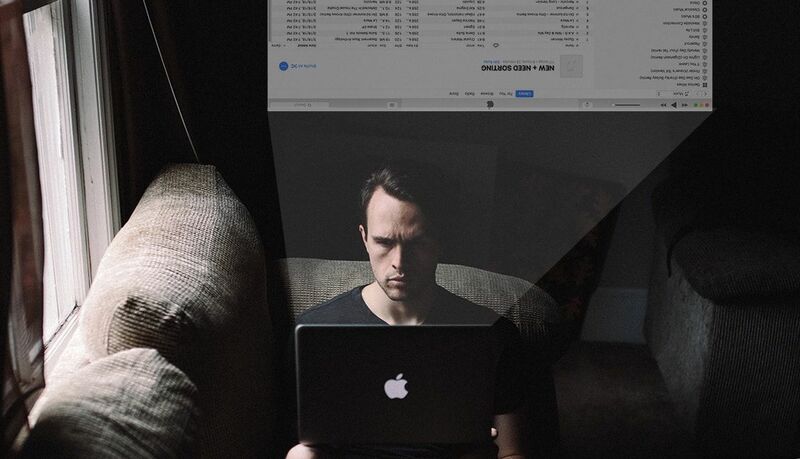 If you’re a DJ with a top 40 pop music club residency who relies on having the hit tracks at each gig, this article might not be for you. But for every other type of gig, it’s important to remember that one of your biggest assets is the music that you already own. If you’ve chosen to buy or download a track and keep it in your DJ library, it must have been pretty good, right? Below are a few great tools and processes for finding new tracks that work well with a new set or playlist that you’re putting together. Pro-Tip: iTunes uses your entire library to build these playlists, and doesn’t consider audio quality in the process. If (like me) you’ve been collecting music for a while, you likely have a lot of lower bit rate tracks in your library. Make sure to double-check bit rate before adding tracks to a playlist you’ll DJ from. 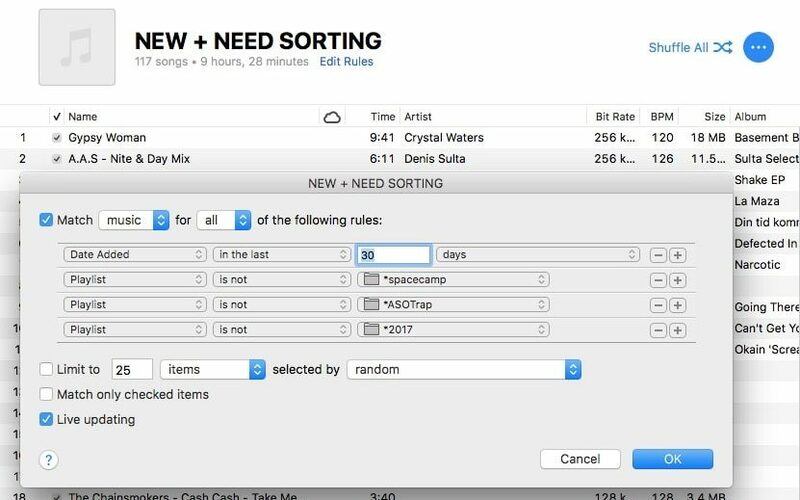 Another great iTunes tip: using Smart Playlists to find tracks that you might have forgotten to process when importing into your DJ library. This can happen all too easily – if you buy a bunch of music, do you always remember to put each track into a place you’ll find it later? I have a catch-all Smart Playlist that combats this – the rules (screenshot above) essentially are “show tracks added in the last month that I haven’t put in any of my DJ folders.” You can select top-level folders in the hierarchy as well – so if all of your DJ music is under one big folder, that will include everything in the sub-folders inside it. You can extend this out further – try making a similar playlist that uses the conditions “Date Added”, “Is Not In The Last”, and “12 Months” to see tracks from over a year ago that you’ve never done anything with. 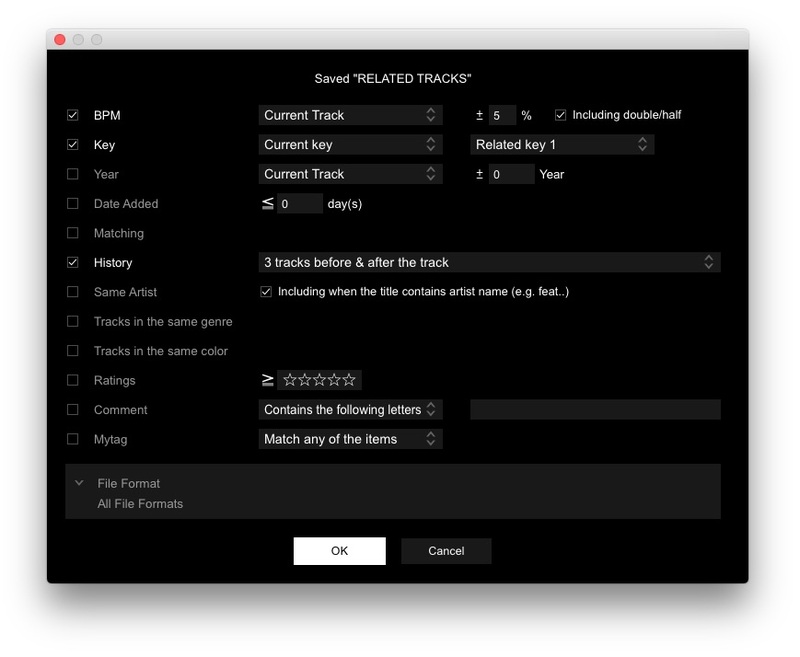 If Rekordbox is already a part of your track preparation process, there’s a built-in customizable Related Tracks filter that you should absolutely be using. It’s constantly looking at the track that is loaded in Rekordbox’s player to find tracks that match the custom related parameters you’ve set. This feature also works in Rekordbox DJ, so if you’re mixing on the platform, it’s a great way to find older tracks in your collection on the fly – no need to make a new playlist. Ever used Kado, the crate digging companion tool for DJs? It’s a great utility (read our review here), and the default behavior is that it exposes you to new tracks based on one that you’re currently enjoying. 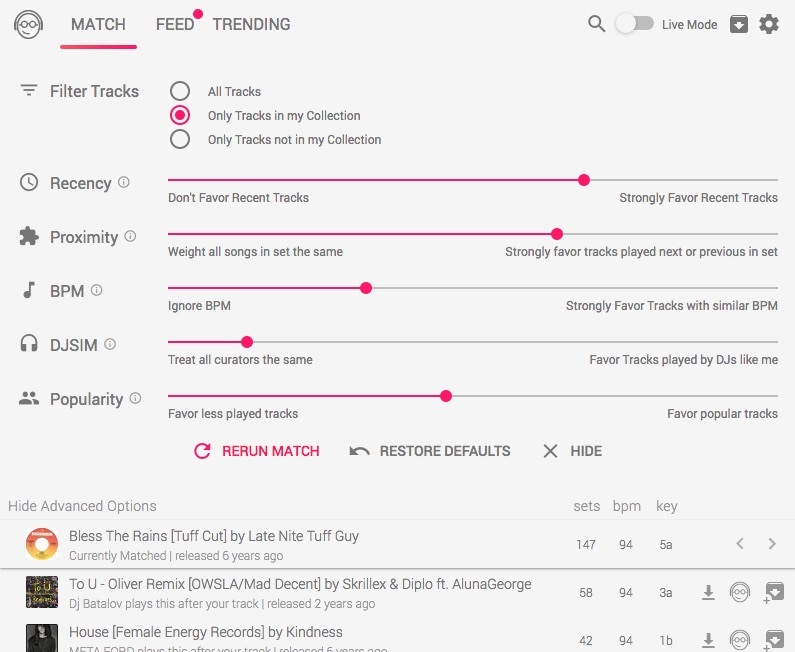 However, if you dive into the Advanced Options of any results page, there’s a way to show only results of music that Kado knows you already have in your collection. This is useful because you still have the intelligence of Kado’s algorithm (basing results on what real DJs played before or after your original track), but within your own library. This is a tip that I use almost every time I find myself getting bored with DJing. What I usually find is that I’m not really bored with the process of DJing, but I am uninspired by the music that I have played too often. To knock myself out of this, I’ll start by playing a song that I’m into – but then browsing my entire library sorted by a compatible BPM or Key to choose the next track. So when I’m practising at home I will always search for my next track by melodic key. If I’m putting together a playlist for a gig then I tend to already know what I’m taking from my recent tracks, so – when I’m just jamming – searching my entire library by key points me towards tracks that would otherwise have been forgotten. 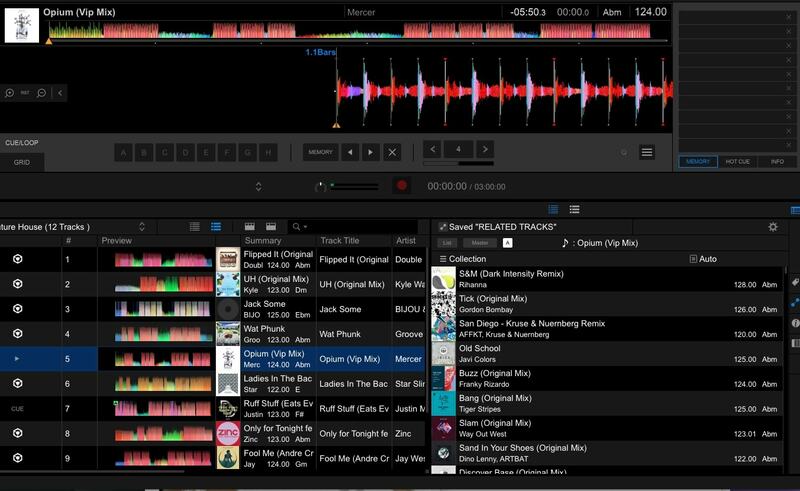 On CDJs, you can just choose BPM and Genre from your browse screen – but if you’re using DJ software like Serato DJ or Traktor, you’ll need to sort your entire library by those parameters. This freeform style of track selection is really fun, and a great way to find inspiration for future sets.